In a large pan, heat olive oil over medium high heat. Turn slow cooker on*. In a large bowl, toss beef together with salt, pepper, and flour to coat. Add to the pan and cook until all sides of the chunks are browned (about 8 minutes). While beef is browning, add potatoes, carrots, parsnips, onion, garlic and tomato paste to the slow cooker. Stir to coat. 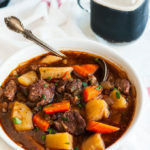 Add browned beef, beef broth, and Guinness to the slow cooker and stir to combine. Cook for 3-4 hours on high, 8-10 hours on low. Add salt and pepper to taste and serve with a pint of Guinness. I use a 5 quart slow cooker. Make sure to check the size of yours and adjust any slow cooker recipe accordingly!